So, when I first heard about this book, I thought it to be from my favorite genre : Mytho-thriller. But no, it wasn't. Then, I read the summary, oh, a contemporary thriller, no, it wasn't. I started reading it, I thought its a horror one. No, it wasn't. Surprise surprice, it is about the least favorite subject of mine. Science! That too, quantum science. And finally, while putting down the book as I finished it, Oh my gosh ! I can't believe physics can be so interesting ! 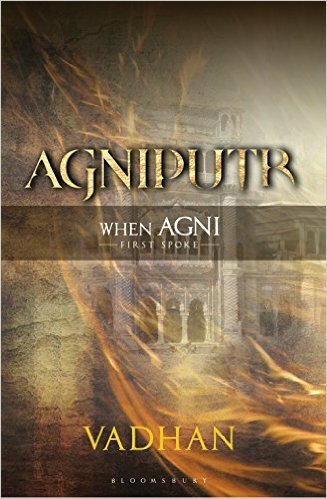 Vadhan's Agniputr (Son of Fire) is the book I am talking about. Its a story about an unknown force and how it has got so much power, enough to destroy whole world, or enough to create altogether a new world ! Leading the story are Sheila the 'sci-fi' scientist and Surya the 'hifi' lawyer. Indeed, the pair is amusing and entertaining while they are together. The writer keeps the mood pretty light while they are in the scene. Similarly, when there is a mention of the power, the 'Sutram', the feeling of spook, the uncomfortable feeling of being scared in dark even at night, comes naturally. That indeed, is sign of perfecting the words. Full marks to the writer for that. The plot starts in 1940s but soon comes back to present. Writing style is fluid, which won't let you go check your phone notifications. Surprisingly, while the story progresses, the characters starts giving you dose of lightweight humor. A welcome relief indeed in otherwise 'getting tense' mood. I won't reveal any more characters or the storyline further. But will say, this is worth reading if you love thrillers and even paranormal things, it will be added bonus. Oh, and as the title already has given it - waiting for the sequel. Oh, and here's the trailer of the book. You can buy it from here .